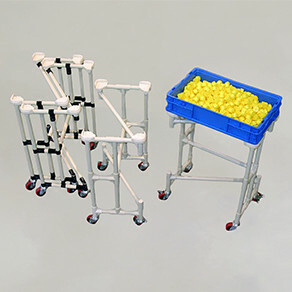 Portable Tool Carts present tools for quick, orderly identification, convenient retrieval and return, effective visual management while supporting 5-S principles. 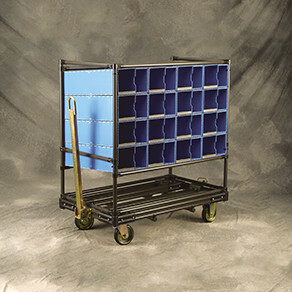 Housekeeping Carts conveniently store and transport cleaning supplies, brooms, dust pans and hand brushes, plus trash containers and bags supporting 5-S principles. 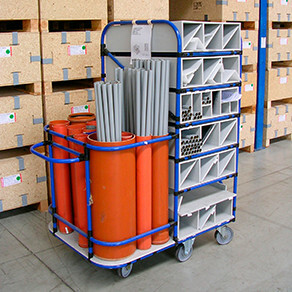 Narrow Aisle Warehouse Carts are ideally suited for order picking or kitting operations that face the challenges of narrow aisles in warehouses or component storage areas. 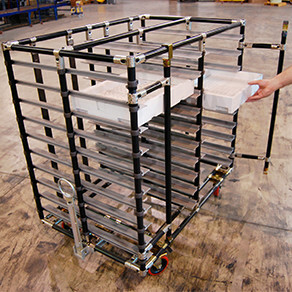 Compartmented Dunnage Carts prevent part-to-part contact, groups parts for kitting and in sequential order, and provides quick visual inventory identification. 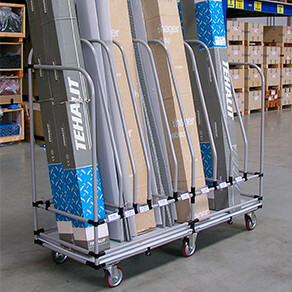 Pivoting Push Carts require minimal effort and near-zero turning radius enhances maneuverability in narrow aisles and dead-end pathways. 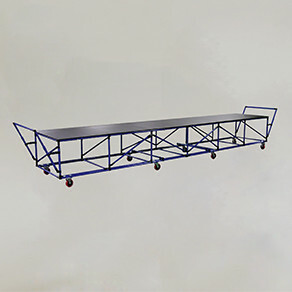 Cradle Carts with an open deck design is easy to load and unload long items and side rails prevent roll off while 6-caster design provides good maneuverability. 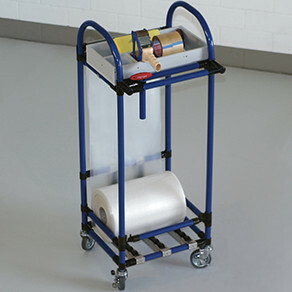 Utility Packaging Carts dispenses rolled wrapping, holds various shipping supplies and tools while being easy to push and hold in place with locking swivel casters. 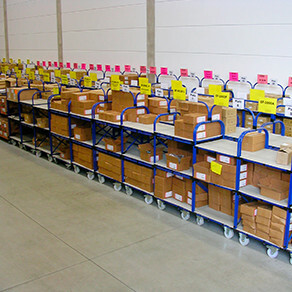 Kitting Carts for safely transporting and orienting parts, components and assemblies on height-adjustable open shelving to properly present them to assemblers. 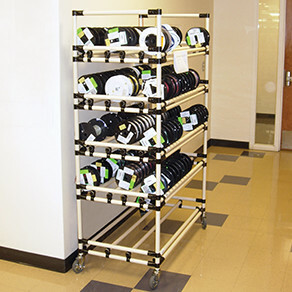 Wire Spool Carts have three rows of spools in five levels making it easy for users to identify, retrieve and return and simple for material handlers to keep stocked. 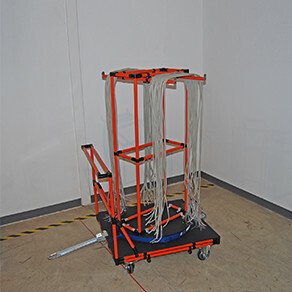 Wire Harness cart/rack prevents tangling and misidentification of components at assembly stations, while providing secure transport and ergonomic part presentation. Cantilevered Cartsare built with 42mm pipe & joints safely transports large parts without packaging while large internal openings improve loading and unloading efficiencies. 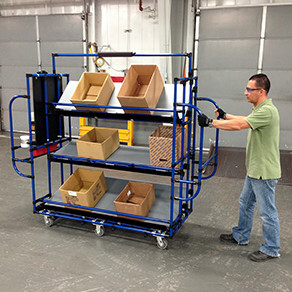 Extreme Size Carts can be custom-built to safely transport large, sensitive parts within production facilities. 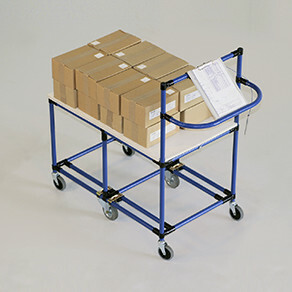 Kitting Carts present tools for quick, orderly identification, convenient retrieval and return, effective visual management while supporting 5-S principles. 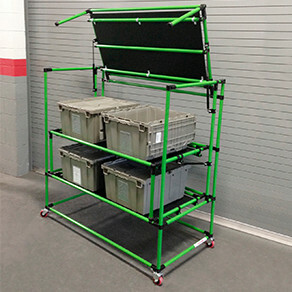 Z-Container Carts easily move totes or containers within a work cell at an ergonomic height and then nest when not in use using minimal storage space. 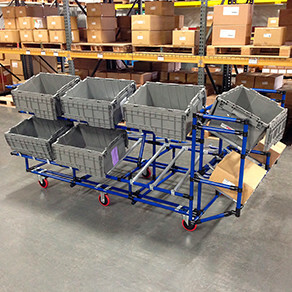 Picking Carts feature three angled shelves on each side for holding either totes or boxes and cant toward the outside providing good load/unload access. 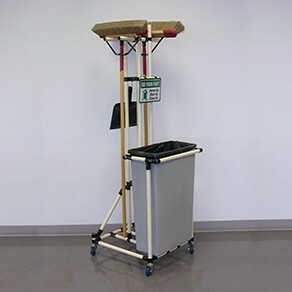 Oil Pail Carts with a foot lever contains a standard hazmat container with lid that elevates the pail at a convenient height while providing a formal appearance as a waste station. 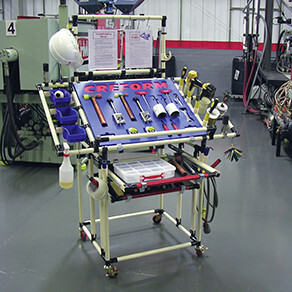 Coolant Recovery Carts drains coolant off machined parts, and drip pan has a built-in drain and hose hooked up to a container for capturing the coolant. 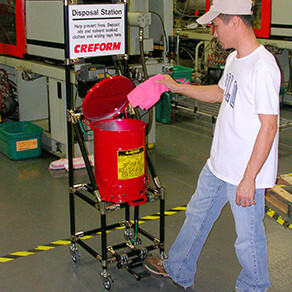 Grinding Wheel Carts allow one person to easily move heavy grinding wheels from tool rooms to machines without the aid of a powered vehicle. 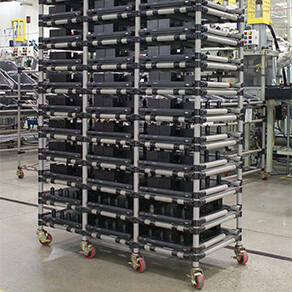 Tray Carts With Doors holds 80 spark plug trays. 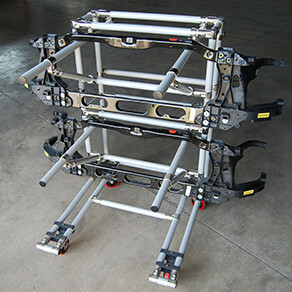 Swing out doors open on one side for easy load/unload and then latch close to secure the trays during transport. 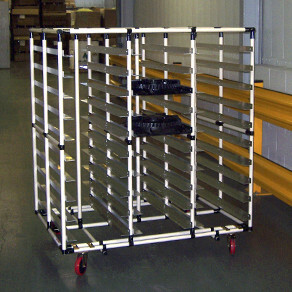 Kitting Carts efficiently transports kitted, cut-to-length materials to assembly areas and then identify different segregated lengths for rapid retrieval. 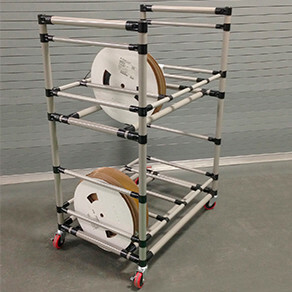 Warehouse Shelf Carts built using bent pipe require less joints to build and solid shelves are well suited for holding unpackaged parts or small packages. 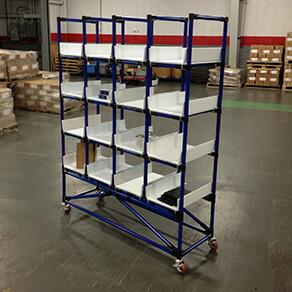 Tall Shelf Carts accommodate large quantities of trays containing small parts and safely transports them to production assembly lines. 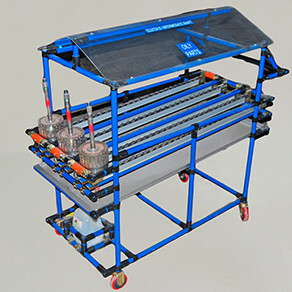 Bent Pipe Vertical Divider Carts vertically hold multi length products providing quick identification and retrieval while bent pipe also requires less joints to assemble cart. 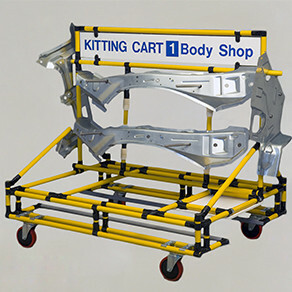 Bag Carts eliminate the need for custom packaging while providing quick identification and safe transport to production facilities for odd-shaped, lightweight composite parts. 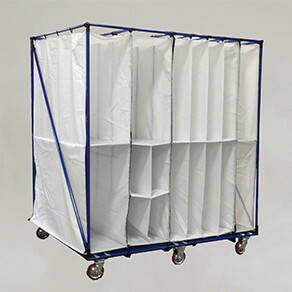 Kitting Push Carts have flexible plastic shelving for safely handling various sized unpackaged sensitive parts from warehouse and kitting areas to production areas. 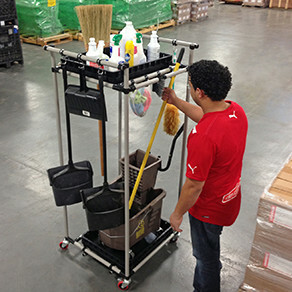 Clean Up Carts are designed and built to conveniently hold cleaning tools and supplies in support of 5-S principles while keeping everything within easy reach. 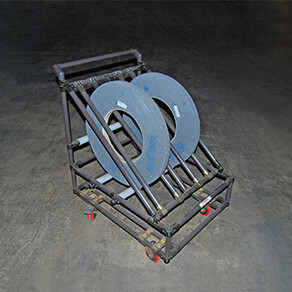 Reel Carts eliminate threading and hanging reels by the center holes speeding up loading and unloading operations ensuring safe, damage free handling. 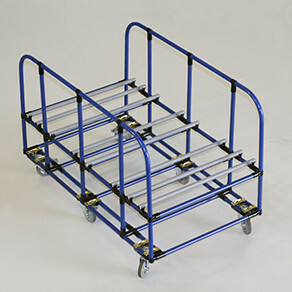 Tilt-Up Shelf Carts are ideal for supplier-to-assembler container shipping by sandwiching totes or boxes then tipping up for unloading and reloading. 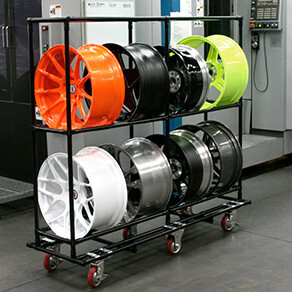 Performance Wheel Carts cradle wheels by their outside diameters to safely transport them through multiple production operations preventing nesting and part-to-part contact. 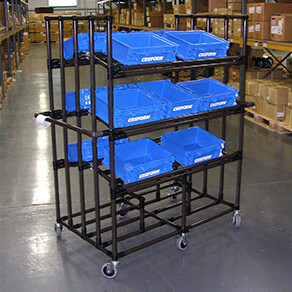 Warehouse picking carts are ergonomically designed to hold multiple large totes on angled shelves canted to provide good visibility into the totes during load/unload cycles. 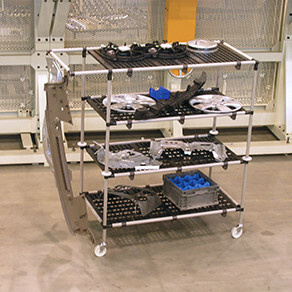 Tray Cart/Rack is ideal for handling parts where high temperature processing is involved, or for curing and drying operations after parts coating or finishing.